Don’t even know if I’m in or not… but I have music now. It’s all I got, but it … may lead me to great things. So here it is, I’ve started working on my project. 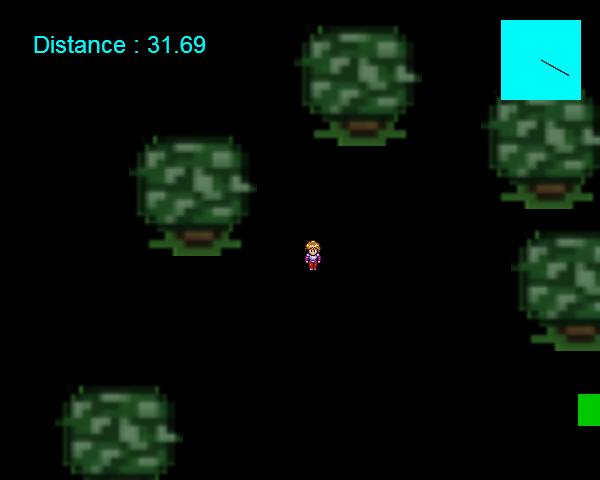 It’s gonna be a kind of adventure game, with very basic gameplay. I’ll try to have something decent for the story. Simple, but coherent. Yeah, I know, the aliasing is terrible, but art is temporary. I wanted to see how it looks like with big trees. The distance is the remaining distance to the target (the green thingy) and the blueish stuff in the upper right corner is a compass leading to the target. I’ll put some images for the distance instead of a figure later. Today I’ll focus on gameplay, and tomorrow I’ll add art and story. Have fun guys !